“Behold my servant, whom I uphold, my chosen, in whom my soul delights;In these passages Isaiah writes of the Messiah. He calls out against injustice and idolatry throughout the book, but the answer to these devastations is found in the passages about Messiah. No matter how dark the path of Israel, no matter how much evil is seen in the world, Isaiah brings the prophetic call for Messiah to the forefront. While Jesus was on earth he claimed Isaiah’s Messianic prophecies for himself. Now that Jesus has gone before us as the first fruit of the New Creation, we have been called the body of Christ. We, the universal Church, have inherited the annointing of Jesus and are called to the fulfillment of his redemption. We are now the servants in whom God delights. Wherever you are, whatever you have done, when God accepts you into his family he rewrites your identity and causes you to be a delightful servant. Our identity is no longer predicated on what we have done, but, instead, it is wholly found in what He has called us. No longer is this only true of Christ, at Pentecost this became the true of His Church. We are given the Holy Spirit even as Christ walked in the Spirit of God. You haven’t raised the dead or performed works of healing or received specific guidance for your life? Well then you haven’t yet experienced the fullness of the Spirit in you. In all likelihood, none of us has experienced the fullest manifestation of the Spirit, but we will; the same Spirit is in you that raised Christ from the dead! he will bring forth justice to the nations. He will not cry aloud or lift up his voice, or make it heard in the street; a bruised reed he will not break, and a faintly burning wick he will not quench; he will faithfully bring forth justice. Christ began the process of redemption. He began to bring justice to the nations when he took on himself the iniquities of us all. He modeled a humility and trust that can only be represented by a lamb being lead to the slaughter. He did not cry aloud, he was gentle and meek. He was the paradox of absolute power and authority surrendered even unto death. By his very acts of submission he gained the name above every name. We are far too often concerned with being heard. Especially in our pain we feel the need to shout it from the rooftops. Social media shows us our desire to be heard in all things and Facebook is filled with cries for attention. But God will not break a bruised reed and will maintain a faintly burning wick. It’s not our power that gets us through the times when we are beaten and down. It is God’s life-preserving grace that walks us gently through the times when we feel all used up. He provides for us the oil that does not run out. He faithfully brings forth justice. We are not called to cry injustice at the slightest insult, but to be instruments of God’s plan to rid the world of injustice. Not a plan that calls out with fury, but a plan that involves sacrifing ourselves for others, a plan that is based on the ultimate condemnation of injustice found in Jesus laying down his life for his enemies and calling out for their forgiveness as they crucified him. He will not grow faint or be discouraged till he has established justice in the earth; and the coastlands wait for his law.This is where we know that ours is a supernatural calling. We know that there is nothing in nature that does not grow faint, we know that not one of us can go through life without being discouraged, but the God of the universe does not faint or grow weary and he will bear us through into the calling of justice on earth. The beauty of Isaiah’s poetry always calls us to earthly restoration. The dry lands will become springs of living water… Isaiah is not concerned with a Heaven that has specific entry requirements and will someday save us from the bad world. Isaiah talks of a time when that Heaven comes to earth in the glorious restoration of all Creation. Jesus is the first fruits of that and is calling us to a ministry of bringing Heaven to our world. Thus says God, the Lord, who created the heavens and stretched them out, who spread out the earth and what comes from it, who gives breath to the people on it and spirit to those who walk in it: “I am the Lord; I have called you in righteousness; I will take you by the hand and keep you; I will give you as a covenant for the people, a light for the nations, to open the eyes that are blind, to bring out the prisoners from the dungeon, from the prison those who sit in darkness. I am the Lord; that is my name; my glory I give to no other, nor my praise to carved idols. Behold, the former things have come to pass, and new things I now declare; before they spring forth I tell you of them.”This is our call! God who created all that is, who gives us our very breath, who enlivens our spirits, is calling us. His call is in righteousness, but, just in case you were tempted to think that this was a call to live under an impossible Law, he will take us by the hand and keep us. Now to him who is able to keep us from stumbling… He will give us as a promise for the people and a light to the nations. We will be the beacon, and the hands and feet of the Lord’s purpose on earth. His purpose to give sight to the blind, set captives free, bring light to those in darkness. God is concerned with actually healing physical blindness and God wants real prisoners freed. God wants to end slavery and release those held in injustice. However, there is more to this imagery. God also wants to heal spiritual blindness and set free people from spiritual prisons. Remember the story of the paralytic lowered through the roof in front of Jesus. He said, “Your sins are forgiven you.” He said this first because his first concern is with our spiritual lameness. 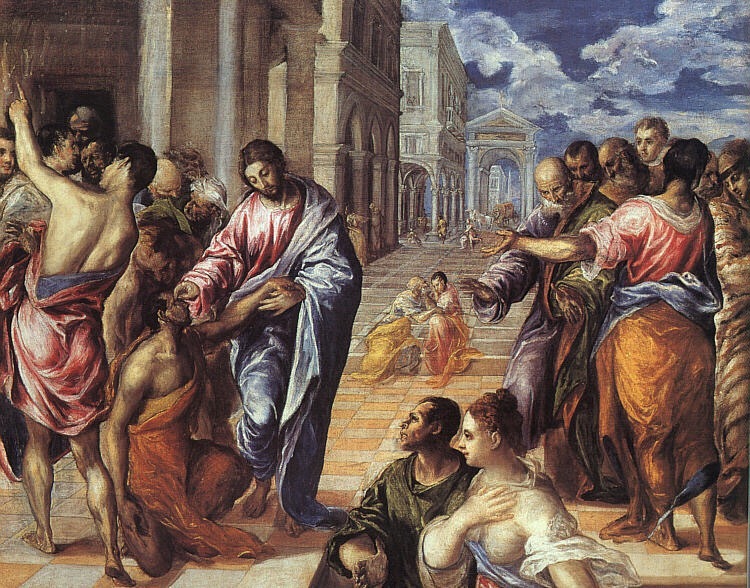 He also brought physical healing, but as an outward representation of the spiritual healing. In this calling we may be tempted to give the glory of our call to others. We can worship money or power or medicine or other spiritual practices or powerful ministers, but it is God who redeems the earth. His glory he gives to no other, except us as we walk in his purposes. For we are called to move from glory to glory. As his body on earth, we are coheirs with Christ. These are the new things being declared. There is nothing new under the sun is a truth outside of relationship with the Almighty Creator of all things. We are called to walk in new things, in even greater things than Jesus did as an individual on earth. He now does greater things through the multitude of members of his body. ‭ It’s fascinating that Jesus did not even read “and the day of vengeance of our God.” Jesus stopped before the first sentence was over. Jesus edited Scripture because he knew that, in the hardness of their hearts, the listeners would read all sorts of bad theology into that phrase. Israel thought that God’s vengeance would be the vanquishing of their earthly enemies. They did not understand that we fight not against flesh and blood; God’s vengeance is against the spiritual forces of wickedness. God is against no man, he is drawing all men to himself and vanquishing the enemies of man which are death, jealousy, strife, pride, hatred, and all evil. We are proclaiming the year of the Lord’s favor over every situation. We are not called to condemn cities or peoples. We are called to comfort those who mourn, cloth them with garments of praise and give them the oil of gladness. We are called to raise up oaks of righteousness for God’s glory. We are called to build up ruined cities and redeem generational sin and depravity. No more are we to call down fire on Sodom and Gomorrah, we are called instead to bring the fire of the Holy Spirit into the cities that they may be raised up and rebuilt in the glory of the Kingdom. This act is inseparably tied to the clothing of those without clothes, the feeding of the hungry, the healing of the blind, and the setting free of captives. If these are not your church’s ministries, physically and metaphorically, then you are not participating in God’s plan of redemption. If you are more concerned with condemning the sinner than setting them free with love and clothing them in garments, then you may have missed Jesus’ ministry.